Spearmint plant which was originally found in Mediterranean region, is the source of Spearmint Oil. This plant is basically a robust perennial herb which is popular for its high therapeutic properties. In ancient Greece, locals used to add it in bath water as an aromatic substance. Spearmint Oil was also used to treat STD ailment like gonorrhoea. In medieval era, this oil was used to prevent discoloration of teeth and to cure sore gums. Spearmint Oil contains compounds like 1,8-cineole, caryophyllene, b-pinene, myrcene, menthol (0.5%), limonene, a-pinene, linalool and carvone. The top note mild smell of this essential oil is more pleasant than the fragrance of peppermint oil. 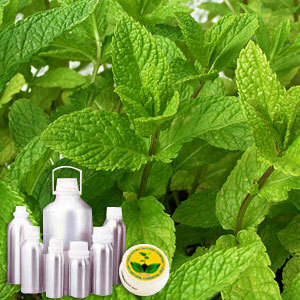 Spearmint Essential Oil can be mixed with other essential oils like jasmine, basil, rosemary, lavender and eucalyptus. This oil is popularly referred as pea, spire, fish mint, lamb, garden spearmint, common spearmint and green oil. The application of Spearmint Oil can be noticed in pharmaceutical arena for its high healing as well as preventing attributes. This oil is effective in treating digestive complications and respiratory problems. Apart from its beneficial value on skin, this oil is instrumental in quickening healing process of stress, tiredness, strain and migraine.